The history of Oxford Second Presbyterian Church is a portal into the industrial past of New Jersey. Founded as a place of worship for the owners and workers of the iron mines, Oxford Furnace, and related industries, the roots of this church are sunk deeply into the history of Warren County and beyond. It all began in 1848 when the pastor of Oxford First Church (founded in 1740) in Hazen, now White Township, began to travel across Dutch Hill to hold Sunday School at the old Stone Chapel erected on Washington Avenue. This was the first place of worship in what is now Oxford and was then known as Oxford Furnace. Oxford Township at the time was considerably larger than today, and in 1753 encompassed White and Hope Townships, plus parts of Harmony and Knowlton. The Stone Chapel was not only the first place of worship erected in town, but also a gathering place for community activities, including Oxford’s first “singing school.” Some of the most noted lecturers in the nation were brought there to instruct the local people in culture and reform, including the famous Temperance leader Miss Frances E. Willard and college professors from New York City and elsewhere. The Stone Chapel also served as the town’s schoolhouse after the present church was built, and until the new brick schoolhouse was completed. The small congregation began to grow as Oxford Furnace expanded from its beginnings as an iron furnace and grist mill, to a manufacturing center. On December 30th 1848, Judge William P. Robeson and his wife deeded the property currently occupied by the Chapel and parsonage to the Trustees of First Church in Hazen. Church Street, Oxford NJ, circa 1916. Organization of the new church in 1863 was the result of greatly changed conditions in the business and population of the community. Business growth began in 1850 when the Car Wheel Foundry was erected to supply the demands of the new railroads. This was followed by the coming of the railroad to Oxford in 1856. In that same year, a powerful steam engine was installed in the blast furnace for the hot blast, which doubled the output and significantly increased business. Beginning in 1861, the Civil War stimulated the iron business to full capacity. During this period, there was an influx of new citizens: Dutch, German, Welsh, Irish and Danes in successive waves. There was also a change of management in the iron business as brothers George, Seldon, and Charles Scranton sold their interests in Scranton, Pennsylvania and returned to Oxford to reorganize the Furnace on a large scale. They brought with them not only their own families, but other families that had been connected with the iron works in Scranton. Having organized the first church in Scranton, the brothers were well suited to establish a place of worship in Oxford to minister to the growing population. The first steps were taken early in 1863 by petitioning the Presbytery of Newton (then sitting at Greenwich Church) to organize “The Second Presbyterian Church of Oxford Furnace, N.J.” Twenty-three members of First Church of Oxford were unanimously dismissed by its Session to organize the new church. Selden Scranton, Elisha Beers and Henry Kingsbury were elected Elders, and immediately ordained to that office. For the nominal sum of $150, First Church deeded the Chapel and future parsonage lots to Second Church. Brick church interior (photo courtesy of Peg Oram). The first pastor was Rev. Isaiah S. Hopwood, who served briefly until 1865. He later became pastor of Newark, New Jersey First Church and First Presbyterian Church of Indianapolis. Following his departure, the Rev. E. Clarke Cline became the first installed minister. He began to supply the pulpit in July 1865, and was formally installed on January 31st, 1866. Rev. Cline was fresh from the Army where he had served as Chaplain of the 11th New Jersey Regiment during the Civil War. Before Rev. Hopwood left, the new congregation had already outgrown the Stone Chapel. 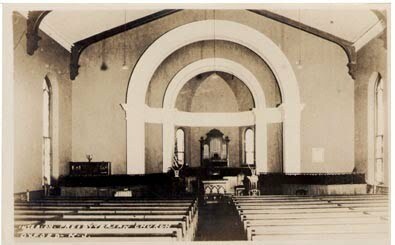 This led to a plan in 1864 to build the Brick Church at a cost of $20,000. The 85 x 100 foot lot, adjacent to the chapel lot, was donated by members of the Scranton family, and deeded to the Church on November 25, 1870, when construction costs were finally paid off. This deed contains a reversion clause to the Scranton heirs if the lot should cease to be used as a church. The same year the Brick Church building was paid off, the building of the parsonage was approved at a cost of $3,000. The parsonage was later completed in 1873. Then in 1886, the Stone Chapel was razed so that the present wood frame Chapel could be erected on the foundation stones of the earlier structure. A great period of expansion in Oxford Furnace and in the Church continued until 1895. The new Iron Company was planning great things for Oxford, building a new Rolling Mill, Nail Factory, a larger Furnace and many other businesses, buildings and homes. This coincided with the biggest growth in Church membership, which peaked at about 300 souls in late 19th Century. Oxford Second Chapel with Rev. W.J. Mewhinney, pastor. ...read more about Oxford resident John Castner’s harrowing delivery of cannon balls to General Washington in Morristown. Do you have any history to share? Do you have any old pictures taken at Oxford Second? Or stories about our church or Oxford that you'd be willing to share? A lot has happened over the years, and we hope to preserve and share our heritage.